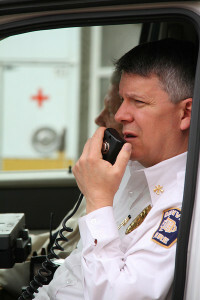 Dave McGrail is an Assistant Chief with the Denver Fire Department and is currently assigned to District 2 Downtown. Dave responds out of Station 1 and supervises one of the busiest Districts (Battalions) in the nation. Split between 3 shifts, District Chief 2 responds to nearly 4,000 incidents annually which yields fast days and sleepless nights. Downtown is a fitting place for Dave who says the best firehouse to work in is a 2-story red brick building that sits on a busy street in a very interesting neighborhood. Station 1 which anchors the busy intersection of Speer Boulevard & Colfax Avenue is just that. District 2 is surrounded by the city’s busiest thoroughfares which encompass a dense concentration of high rise commercial buildings and multiple dwellings, Dave’s specialty. In the shadow of the high rise skyline lies Denver’s oldest neighborhoods with single family dwellings that date back to the late 1800’s. Light & heavy rail train lines, the South Platte River and the Cherry Creek traverse District 2 and play host to all hazard responses. DFD’s Rescue Company, Haz-Mat Company, Collapse Rescue & Under Water Rescue are all housed in District 2 which sees the widest variety of incidents in the city. Dave is a 33 year veteran and second generation firefighter following in the 3/4 boot footsteps of his father, retired DFD Assistant Chief Pat McGrail who spent 42 years on the job. Dave lives in Denver with his wife and two children and is a family man first and a fireman second. Dave served as the Captain of Engine Company 3 in the notorious Five Points Neighborhood and on Rescue Company 1 which responds citywide to all working fires & entraptments. The experience he gained at some of the DFD’s most prominent companies was invaluable to the leadership position he holds now. Dave devotes much of his personal time to the betterment of the fire service and those passionate individuals within it. Dave authored the very popular book, “Firefighting Operations In High-Rise and Standpipe-Equipped Buildings.” The principles of Dave’s book have been adopted and trained on by countless fire departments. Training is one of Dave’s many strong-suites which he has taken on the road as an international instructor. Although Dave is faced with critical and high risk incidents on a regular basis, his most difficult battle is often the complacency of firefighters. Dave’s best tactic to combat complacency is leading by example. Whether it’s responding to every automatic fire alarm and going inside with his companies, donning appropriate PPE regardless of the conditions, climbing high rise stairs to keep fit or adding himself to basic calls only to block lanes of traffic for his working firefighters, Dave walks the walk. His reputation as a top shelf firefighter precedes him, yet Dave remains very humble. There is never a time when visitors aren’t welcome in his firehouse, given a warm reception, funny stories and encouraging outlooks. Dave isn’t shy about the pride he has in the DFD but always enjoys a conversation where he can learn about how other departments work and what might benefit his own. Dave’s enthusiasm and passion for firefighting is contagious and the reason why he is taking to the internet to share his knowledge and experience. Hi! Im very interesting about your new web site chief McGrail! I have read your book se eral time. I am a district chief in Quebec city Canada and we change now, with your vision you let to us, the tactical firefighting in highrise. We hope and work to adopt the 2 1/2 inch hose with smoothbore 1 1/8 ! We make a hands one training like Denver but we have only 3 to 5 firefighter to start an initial attack in highrise fire. We hope that this project will be sucessfully meet the highrise chalenge. Your web site and tips will certainly help us for the culture change! Thanks a lot for your leadership chief McGrail. You will contribute with your experience and knowledge to reduce LODD in highrise firefighting. Stumbled upon your website today and thought I would give you some props. 19+ years ago you were a Captain at training. As a member of recruit class 95-3 you had the most lasting and profound impact on my fire career. Although I left the DFD 13 years ago – your inspiration has carried with me to 3 other career departments. The most profound being ” WE ARE KINGS”. That swagger and confidence you drilled into us has become permanent with me, and, I imagine, the rest of my 95-3 brothers and sisters. I am sure it has proven to be quite irritating to my subsequent departments, as I have always used the DFD as an unattainable benchmark. That is to say , they can be great, aggressive and professional but the “KINGS” ride white and gold trucks and work for the department a mile above the rest – THE DENVER FIRE DEPARTMENT. It is GREAT to hear from you! THANK YOU for your kind words and positive feedback. Thank you for all your hard work! I am a Lt. in Indianapolis and we are re working our high rise ops following most of your guidelines. I am working on attack in non stand pipe buildings using hoist up. Do you know what is the highest distance you can hoist 3in supply up the side of a building or center chase stairway before you are concerned with the couplings failing from the weight/pressure? Thanks!